I love this “pragmatic” dimension. To enter into the sculpture, into the monument, to enter into the publicity, into an image. To enter the contents, I love that you can enter its meaning. In 2004, Hirschhorn was invited to create just such an “enterable” project in Minneapolis as part of Walker without Walls, the series of programs we presented around town during construction of our new facility. 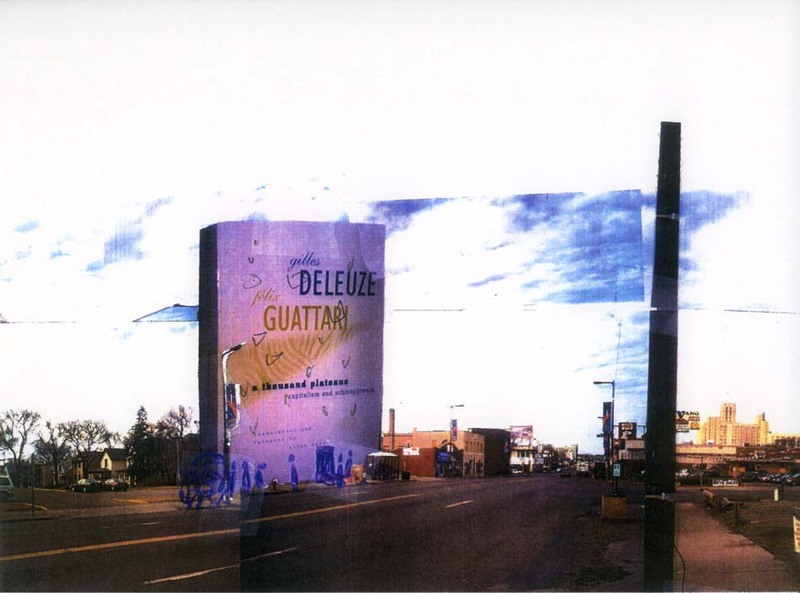 He came up with a Road Side Giant of his own — a 50-foot tall replica of Gilles Deleuze and Felix Guattari’s book A Thousand Plateaus: Capitalism and Schizophrenia. 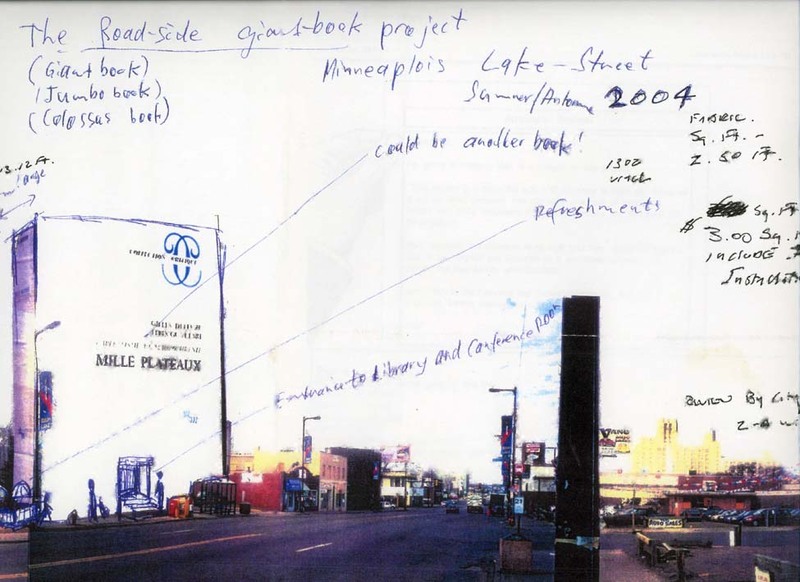 The massive tome was to be installed along Lake Street in south Minneapolis and would’ve housed a library of philosophy texts, the production center for a daily philosophy newspaper he and philosopher Marcus Steinweg were to create, a meeting and exhibition space, and, outside, a cafe. The project unfortunately outgrew its budget and was never realized, so here, for the first time publicly, are plans for The Road-Side Giant Book Project. [H]is project will function not only as a mega-sculpture, but as an ambitious center for philosophy. Deleuze and Guattari’s book is a landmark of continental thought, one that explodes philosophy by exploring it in terms of a host of other disciplines: from popular film and music to genetics and ecology. Hirschhorn will create his provocatively large book-structure in this spirit of bringing philosophy to life, compelling the community to question what role philosophy plays on the street. The artist will be on site every day of the project to animate a series of challenging lectures, produce and distribute a daily newspaper, and invite the participation of the community. As a giant bookkeeper, he will create a library and a “Galazy of Philosophy” exhibition in a room inside the book, as well as host a community run café right outside. “It’s a project for the love of art in Minneapolis,” Hirschhorn says, and The Road-Side Giant Book Project, while far too large to be flying off the shelves and far too heavy to be “unputdownable,” promises to deliver a profound thud on the Lake Street doormat this summer. Hirschhorn laid out his plans for the 36′ x 16′ x 50′ piece in hand-drawn documents, diagrams, and photocopies of roadside attractions, marked up with alternate names (Colossus Book? Jumbo Book?). He created a crude mock-up of what the center might look like, using a color xerox of the area–just east of the then-vacant Sears complex on Lake–pencil markings, and tape. The artist described the project as “an obscene gift. An affirmation that philosophy, that art can conquer a space in the mind of the public… Art and philosophy are not the same thing, but they can do the same thing: summon something that isn’t there.” By engaging the neighborhood–a diverse, mixed-income, urban area–with questions about philosophy’s place in urban existence, Hirschhorn realized his work would face graffiti and damage over its two-month installation–all risks, he says, that are integral to a project he alternately called an experiment, an affirmation, and a confrontation.